Rediff.com » Business » Does Wall Street crash herald a 'Minsky moment'? Does Wall Street crash herald a 'Minsky moment'? 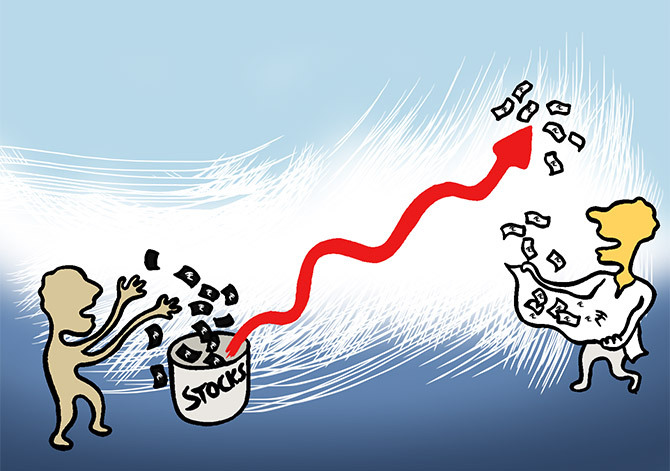 While enjoying long-awaited economic good times -- and hoping they will last as long as possible -- some caution and some prudence might be the best protection against bad surprises, says Claude Smadja. It is when everybody in the business community is dancing in the streets that it might sometimes be a good moment to step back and have a second look. There is of course no denying that the global economy as a whole never had it so good in the last 12 years with the US, the European Union or EU area, China, and Japan registering comfortable growth rates. In most of these economic regions, investment and domestic consumption are lifting the economy, manufacturing activity and business confidence are at levels not seen since a long time, and stock markets are in the most exuberant of moods. While China’s financial situation was a matter of concern in 2017 and dealing with financial risk was ranked as one of the top three priorities at the last meeting of the economic work conference last December, Beijing has taken a very proactive stance in reducing the size of shadow banking, in forcing companies and regional institutions to de-leverage and in containing the asset bubble. Meanwhile, streamlining of state-owned enterprises or SOEs and the process of reducing excess capacity continue, thus ensuring that while growth in 2018 will be slightly slower than the official 6.9 per cent rate of 2017, it should be on a more sustainable basis. Many emerging countries have also been joining the fray, complementing this overall rosy economic picture. In these conditions, nobody would want to be seen as missing out on the good times and any CEO who would do that might be severely penalised by her/his shareholders. So why is it that some people are now starting to speak about a “Minsky moment”? This comes from the theory of Dr Hyman Minsky, a financial economist who has observed that a period of economic prosperity and stability leads economic players to increasing risk-taking and excessive borrowing and investment, which then creates a period of instability and slowdown-- or even crisis -- generating a more risk-averse behaviour. While not wanting to play the contrarian voice, a legitimate question can be raised as whether we are not witnessing the markets plunging into a new period of what then Federal Reserve chairman Alan Greenspan labelled as “irrational exuberance”. There are questions whether a new stock market bubble has been building up in the last few months. One big enigma of the last period can be summarised in one word: Inflation, or rather the lack of it. With the inordinate amount of money injected in the economies of the US, the Euro Zone, and Japan through the quantitative easing or QE policies of the central banks in the last few years, with a full employment situation in the US, Japan or Germany, with interest rates at zero, close to zero, or even at negative levels, inflation has not budged. To the point that there is now some discussion on whether the traditional inflation target of close to 2 per cent adopted by most central banks as one key guidance for monetary policy should not be revised upwards to 3 per cent or 4 per cent. However, it is difficult at this stage to predict how the situation will evolve in the coming months, for instance, with respect to the impact that US President Donald Trump’s tax reform may have in a context where asset bubbles are beginning to appear. Another factor has to be taken into account against that factor: The global economy is just beginning to emerge from an unprecedented experiment in monetary policy during which all the key economic areas of the world had pursued very lax monetary policies with the quantitative easing they had to implement to get the economies out of the doldrums. We have now the reverse situation where all these economic areas are simultaneously tightening their monetary policies. The US Fed started first with the end of its QE and three rate hikes in 2017, which should be followed by three new raises this year, bringing the Fed rate at 3 per cent by the end of 2018. The European Central Bank is now reducing the amount of bonds it has committed to buy every month and may well decide in September to end its QE programme. There will be significant pressure from Germany to that end. China is in a process of tightening to reduce financial risk; even the Bank of Japan is now reducing its bond buying programme and is beginning to envisage the end of the easing policy that Haruhiko Kuroda, its president, had been pursuing so vigorously in the last four years. Will central banks be able to calibrate and modulate this general monetary tightening in such a way that it would not precipitate an economic slowdown? How will the incoming chairman of the US Fed, Jerome Powell, react if he sees some signs of overheating or asset bubble? His predecessor, Janet Yellen who will leave office at the end of February, preferred to be “behind the curve” when it came to tighten the monetary policy. Will he be as cautious or will he prefer to be “ahead of the curve” at the first sign of overheating risk? It would be good to keep these question marks in the back of everyone’s head. And this, without ignoring or underestimating the disruption risks created by a very volatile geopolitical context. In Europe, for example, the outcome of the national election in Italy next March is less than certain, with a real possibility of the populist right getting a shot at the government with tremors that would reverberate throughout the Euro Zone; there are uncertainties about the way the Christian Democratic Union (CDU)/Christian Social Union (CSU)/Social Democrats coalition will be able to function in Germany -- if the coalition is indeed confirmed -- and the ability of Berlin to continue to play the kind of leading role in shaping European policies. All of this without ignoring the continuous absorption of energy that the Brexit process will generate. In a different domain, the rise of protectionism and mounting trade and economic frictions can at any given moment degenerate into a low, or high, intensity trade war. Mr Trump just slapped anti-dumping tariffs on solar panels and washing machines, clearly targeting Chinese and Korean imports. This follows the actions taken on aluminum and the opening of an investigation against Chinese practices on intellectual property and on Beijing pressures on foreign companies to share technology. And more might be in the offing in the coming months. Europe is also tightening the screws against Chinese investments in technology areas considered strategic. At what stage will Beijing react and it what way? Mentioning all these elements is not being a Cassandra. It is just a reminder that while enjoying long-awaited economic good times -- and hoping they will last as long as possible -- some caution and some prudence might be the best protection against bad surprises. Claude Smadja is president of Smadja & Smadja, a strategic advisory firm. Is India in an equity bubble? Are you ready for a sudden correction? In 2018 will the markets see a bull run or be in a bear hug?